Excavation and earthworks are a fundamental part of almost all building projects. You simply cannot construct a solid structure without the proper foundations. Marshall Excavations are licenced builders and excavation specialists with over 30 years’ experience. 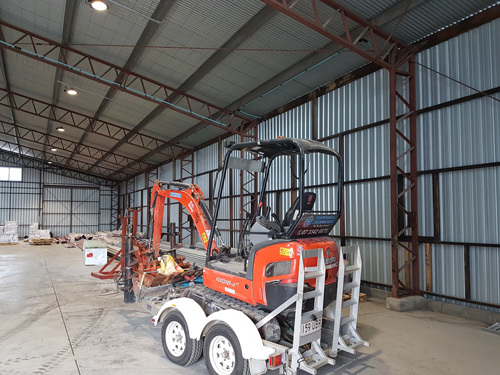 We routinely undertake construction and renovation projects, which means we are familiar with the importance of effective earthmoving and excavation. Whether your project is residential, commercial, industrial or civil, we can help. Our priority is to provide a professional, quality service. Using our vast experience will provide peace of mind for your excavation project. Communication is key and our expert project manager who will manage all enquiries on site. We will keep you updated on key issues throughout the process. With our professional approach, you are guaranteed a safe construction environment, with timely delivery of results. Marshall Excavations understand the nuances in every earthmoving project. We are expert in targeting the right equipment and specialist for each project, to ensure our clients receive an optimum outcome, on every job. Our excavator is a 1.8 tonne machine capable of efficiently moving rocks and earth in almost any environment. Our plant and equipment is expertly operated by trained specialists and we boast the latest in excavation and earthmoving technology. Our experienced project manager also oversees all earthmoving operations, to ensure your project is done effectively, with perfection. We guarantee the best results, every time. Safety is a high priority for all our operations. Our machinery is immaculately maintained, and all safety features comply with the highest standards. To adhere to stringent safety guidelines, we have a well-equipped workshop to manage all maintenance procedures. We recognise these safety standards can only be upheld if certified experts operate the machinery. That is why our excavation and earthmoving team consists of accredited and trained operators, with extensive experience to back them up. We have built a reputation for safe and effective work practices having undertaken extensive earthworks on sites right across Brisbane. Effective communication is the key to your hassle free construction project. At Marshall Excavations, we will work closely with you and your project team every step of the way. If you are commencing a construction project, then we can help. Our earthmoving services are well suited to residential, commercial, industrial and civil projects alike. The first step to almost all construction projects is earthworks. If you are interested in engaging our earthmoving services, simply contact us for a quote. We will discuss with you the details of your project in order to establish, which of our services you require. This will allow us to provide you with an accurate quote, and help create a customised plan to meet your earthmoving and excavation needs. All sites are different and there are various factors to take into account when organising earthworks. These factors include accessibility of the site, terrain, gradient, soil and the nature of your construction project. We will assess your needs and any special requirements through a site inspection. Our safety work method statements are thorough and regularly updated to meet the relevant industry standards, and will ensure safe work practices are detailed in your site examination, ensuring employees, subcontractors and clients are not exposed to any risk. With all the information necessary to proceed with your earthmoving project, Marshall Excavations will move quickly to complete the task. We have a range of advanced earthmoving equipment and we are capable of moving large volumes of earth and rocks. Under the direction of our professional site manager, we will ensure a perfect outcome. To ensure your project gets off to a great start, why not get in touch with our specialist team at Marshall Renovations. We can advise on all stages of the excavation, earthworks and construction process – advising and quoting every step of the way. Just follow the prompts on our website and fill in our online contact form. Of course you can always give us a call to discuss your specialist project needs, or get answers to any questions you may have. 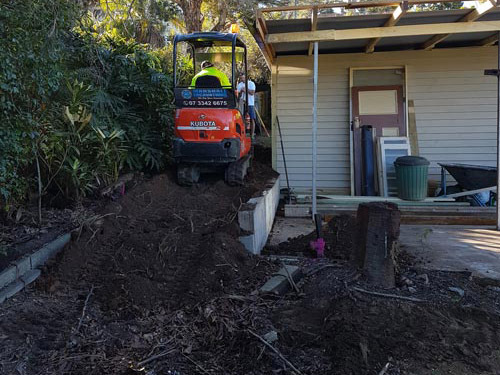 #1 In what suburbs do you offer your earth moving Brisbane services? 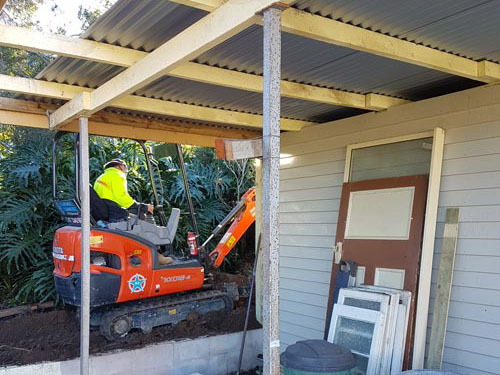 At Marshall Excavations, we have been in the Brisbane construction industry for over 30 years. During this time, we have seen Brisbane expand rapidly. This has given us a valuable insight into the importance to earthmoving and excavation services in the Brisbane area. To meet the growing demand for earthworks in Brisbane, we have expanded our services to cover Brisbane and its surrounding areas. We can provide our services throughout the region to ensure that you get effective, safe and high quality earthmoving for your construction project. #2 Does your excavator hiring service also include an operator? Excavators are large and complex machines that must be handled with care. Because of this, we have a team of experienced and skilled operators to accompany our excavators. Our safety standards are among the highest in the industry, which means that we only employ operators with the relevant qualifications. These qualifications include licences and safety certificates. With this training and a wealth of experience behind them, our operators can ensure that you get proficient and safe earthmoving services. 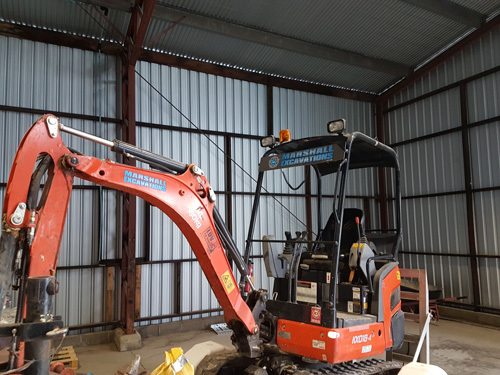 This a paramount feature of your overall construction project, which is why the team at Marshall Excavations take it very seriously. #3 What size excavation projects can you undertake? At Marshall Excavations, we have been heavily involved in construction projects of all sizes throughout our time in the industry. This has afforded us a great deal of knowledge in terms of residential, commercial, industrial and even civil building projects. Excavation is often the cornerstone of a construction project, and we have seen firsthand the best methods for approach small, medium and large earthworks. 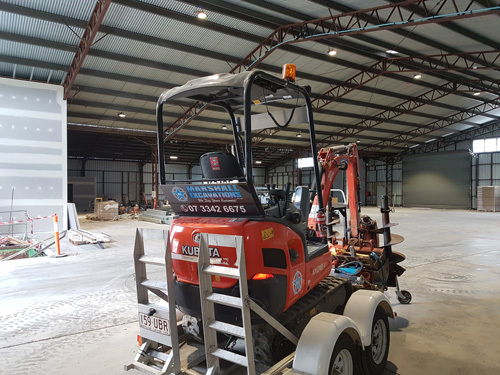 With this experience and our state of the art range of earthmoving machinery and equipment, we are able to take on earthworks for residential, commercial, industrial and civil clients. If you are concerned about the size of your earthmoving project, you can simply give us a call. Our team is happy to share some knowledge with you and provide you with an outline of our services. #4 Will you be able to dispose of rubbish and soil from my site once the earthworks are complete? Our earthmoving projects deal with large volumes of soil and earth and we understand the clean up process can be difficult if left to our clients. To save you the hassle of dealing with this, we offer rubbish and soil removal services. Once your earthworks have been completed, we will gather all the soil and rubbish from your site and dispose of it in a responsible and environmentally conscious manner. If you would like more information on our disposal procedures, feel free to give us a call. #5 Do you have all the necessary insurance policies? Insurance is an important – and often legally necessary – part of any construction project. We take every precaution to ensure that our earthmoving services are performed to the highest possible standard of safety. That means that the likelihood of anything going wrong is negligible. However, to comply with the relevant regulations and protect your investment in the project, we have extensive and up to date insurance policies. #6 What are your terms of payment? Our terms of payment are outlined in your quote. To ensure that you can pay conveniently we accept credit card payments or cash. When we provide you with a quote, we will outline the nature and extent of our services, as well as the price. You can consider this price before accepting the terms of the quote. Our staff will remain accessible during this period to address any queries that you might have. If you have any questions about the services we offer, the rates we charge, or our terms of payment, please do not hesitate to give us a call. Copyright © 2019, Marshall Excavations - All Rights Reserved.